A family is shipwrecked in the Pacific ocean by a school of killer whales and have to survive in a dinghy for more than a month with hardly any food or drinking water. 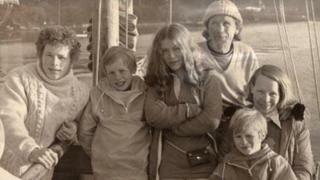 It sounds like a fantasy story from a classic adventure novel, but this was the reality for the Robertson family from Staffordshire while on a voyage around the world during the 1970s. When they were rescued by a Japanese fishing boat, 40 years ago this month, their story made global headlines. In 1970, retired merchant navy officer Dougal Robertson was running a dairy farm at Meerbrook, near Leek, with his wife Lyn, 18-year-old son Douglas, daughter Anne, 17, and twin sons Neil and Sandy, both aged nine. "We lived in a very isolated situation," said Douglas, who is now 58 and living in London. "My father thought in order to offset that he would take us around the world in a boat to educate his children in the 'university of life'." On 27 January 1971, the family departed from Falmouth in Cornwall on board a 43ft (13m) wooden schooner called Lucette, which they had bought with their life savings after selling the farm. "Father's planning for this journey was zero, we didn't even have a practice sail around the bay before setting off around the world," said Douglas. "I always remember my dad at the wheel as we set sail from Falmouth, [he was] stamping on the floor and shouting 'Yee-haa'. "He was actually living his dream at that time." "A wave broke across the bow and the cold wet spray lashed our faces and we suddenly got an inkling this wasn't going to be a walk in the park." Over the next year-and-a-half the family sailed across the Atlantic, stopping at various Caribbean ports. But 17 months into their voyage, while on the Pacific ocean, the boat was struck by a pod of killer whales near to the Galapagos Islands. "The whole boat shook and the keel must've cracked. There was a splintering noise of wood cracking, if you can imagine the sound of a tree trunk being snapped in two," said Douglas. "I heard this splashing noise behind me and there were three killer whales following the boat." Although wild killer whales are not considered a threat to humans, Douglas, then just a teenager, thought he was going to be "eaten alive". The family members, plus Robin Williams, a student hitchhiker they had picked up, scrambled on board an inflatable life raft and dinghy. Douglas said: "It was a 10-man raft but it could only take five people comfortably. We had bellows to keep it inflated but they broke after a few goes so I had to blow it up with my mouth. "We were beset with problems from the moment we set sail on that raft." Dougal Robertson had the idea to sail the raft to the centre of the Pacific and catch the counter current back to America. The group had several cans of water and some rations on board, including dried bread, biscuits, onions and fruit, on which they managed to survive for six days. After that they caught rainwater in containers and hunted turtles and fish to eat. "Turtle was the mainstay of our diet. We drank its blood when we had no water, we dried its meat and rationed it and stored it up," said Douglas. "We rendered the fat down in the sun to make oil which we rubbed on our skin and drank to keep us warm." The inflatable raft became unusable after 16 days, so the six people crowded into the 10ft (3m) long dinghy called the Ednamair, taking turns to sit in the dry part of the boat. On 23 July 1972, 38 days into their trip in the Ednamair, they were finally picked up after a Japanese fishing trawler, the Toka Maru II, spotted their distress flare. "My dad had been sunk once before in Ceylon [Sri Lanka] by the Japanese in 1942 and here they were in 1972 picking him out of the water and saving his life. "He did say that if for no other reason than to be able to forgive the Japanese for what had happened the trip was worth it." Before his death from cancer in 1992, Dougal Robertson wrote a book about the family's adventure called Survive the Savage Sea, which was turned into a film. He used the profits of the book to buy another boat and went to live in the Mediterranean, while his wife Lyn went back to farming. Douglas went on to join the navy and then became an accountant. After the family donated the Ednamair to the National Maritime Museum in Falmouth, Cornwall, in 2008, Douglas wrote his own book called The Last Voyage of the Lucette because he felt his father's account did not give other family members enough credit. "I never regretted the trip even in the darkest hours," said Douglas. "In a funny kind of way life had a quality to it, the quality of survival, the reward of seeing another sunset, another sunrise. "We felt like wildlife must feel in the jungle, to live another day was our only goal."